It had to be something fresh, but something rich enough that it says something. There is a lot of gardenia, [and] a little citrus because I think of Boca as hot, and the black currant and a little grapefruit. When it’s hot, if you wear something fresh, after a half hour, you want to have something dry on your skin [so I added] amber, which is very rich. In the hot weather, I like to have amber on my skin. Additional notes reportedly include lily of the valley, freesia, hedione, cedar, cardamom and musk. I think i'm the biggest Bond no. 9 fan alive and i want this BADLY!!!! It sounds awesome. I'm hooked just reading about it. Gardenia! with amber, cedar, cardamom, and musk.. can't wait to try it. Honestly, I think sometimes they just try too hard with too many releases. But we'll see about this one! I'm optimistic! I did not make the launch last weekend, but I am here to tell you that Boca is nothing, nothing like New York on the beach (which is already on the beach). I am still hoping to get there to sniff this. New York on the beach probably DOES smell like a rat's mouth. I don't know why, but I am strangely compelled to buy this based only on the gorgeous bottle. This wouldn't be too strange for most but I NEVER buy a perfume for the bottle and will get tester bottles before retail if it will save me some dosh and allow me to buy more perfume. It is just so pretty! I imagine it woud be impossible to get outside of America. 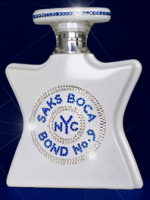 I imagine its impossible to get even outside Boca, unless you're willing to pay Saks to ship it to you. Don't know if they ship overseas or not.